The art of making Indian block printed textiles is a labour-intensive, painstaking process that has survived from ancient times to the present. Scraps of cloth found in the ruins of Mohenjo Daro, an ancient city of the Indus Valley civilization, provide evidence that block printing was practiced in India as long ago as 3000 BC. The art flourished in the 12th century under the patronage of the rajas. The 17th century saw a revitalization of the art and block printing of fabric by hand is still now a thriving activity. 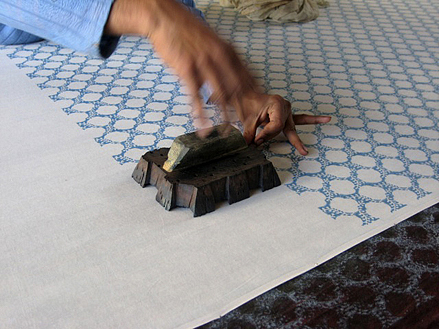 The three main tools to make block printed fabric are the wooden blocks, the fabric and the dye. It can take five carvers up to three days to create an intricate design in a block of teak for use as a printing block and the printers may use up to 30 blocks to complete a design. Separate blocks are required for each of the colours. The process begins with the wooden blocks. Wood carvers cut designs into blocks of different shapes and sizes. The top of the block has a handle for the printers to grasp. Each block has two or three cylindrical holes through it to permit the passage of air and to allow excess dye to squeeze out. Each block is soaked in oil for about 2 weeks to soften the wood. Printing is done from left to right. 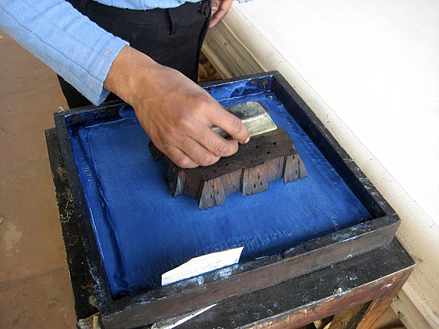 There are several methods practiced and we will concentrate on the discharge or direct block print methods. The printer dips the block into the dye then presses it onto the fabric. 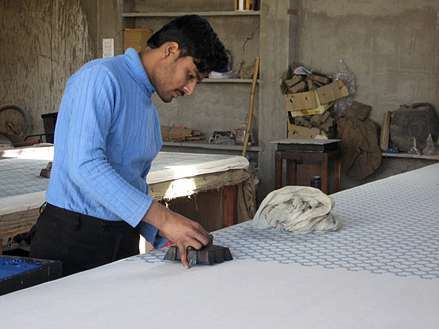 He then slams the back of the block hard with the fist to create a clear impression and moves the block to the next portion of fabric to be dyed, using points on the block to serve as a guide for the placement of the block. As they work, the printers pull a wooden cart bearing their blocks along with them. The wooden blocks can be interchanged from one piece of fabric to another, creating different patterns. First, the fabric is dried in the sun to fix the dyes and then rolled in newspapers and steamed in special boilers. It is washed, dried in the sun again, and ironed. And it seems to work. 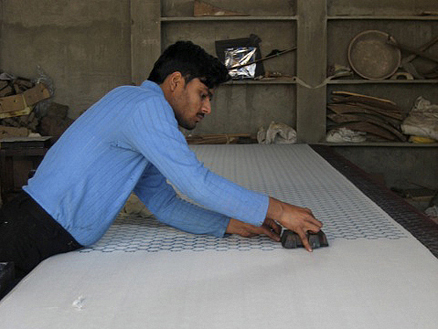 This process of Indian block printing has been used for centuries and is still in vogue. Hand Block printed fabric makes wonderful blinds and curtains. 100% cotton. Width 110 cms (43.5 inches) Machine washable – available at £8.00 per metre / yard. 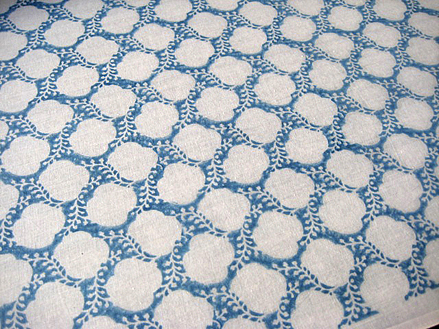 Hand Block printed tablecloths – available in medium or large size, rectangle or round – from £16.00. Hand Block printed bedspreads – available in medium or large size – from £45.00.